Playing abilites/instants after "When it enters the battlefield, sac it if X"? Can you play Phyrexian Dreadnought and Burnt Offering? Can you sac a phyrexiand readnought to a different dreadnought's trigger? I'm not sure if copying Thing in the Ice Flip is useful. 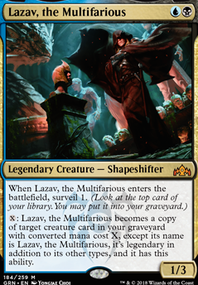 Lazav, the Multifarious is able to copy just one side of Thing in the Ice Flip so he can't transform into Awoken Horror . Copying Phyrexian Dreadnought or Skithiryx, the Blight Dragon looks much more fun. Hey, I've tested your Lazav deck against my Lazav deck Kill and Run (Lazav) in a mirror match. What I liked was there are many good ways to set your commander online with acitvating his ability. There are different cards in both decks, like you are really going deep into the draw/discard theme while my deck has more cards to get a safe board state or that I'm using the Surveil-mechanic more often. But they have many things in common like some fatties to pump up Lazav ( Phyrexian Dreadnought ). The control theme does work very smoothly in your deck, there are enough counter spells and destroy effects in it. 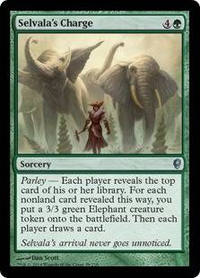 With your average CMC you may be able to cut some lands. Strenghwise both decks are nearly at the same power level, in my opinion around 8 of 10. We know that Mana Crypt , Lion's Eye Diamond or any of those high end cards would rise the strengh of this deck, nevertheless for playing casual (and not competitive) this is an awesome deck. Congratulations. Hibernation Sliver is interesting to put it in instead of Cavern Harpy , because the sliver has no triggered bounce ability printed. Good build, some unusual includes, most mentioned in the comments. If you want another deck to look at I’d recommend mine, Dimir Dimir on the wall, it tried to have a dimir flavor and sub theme. 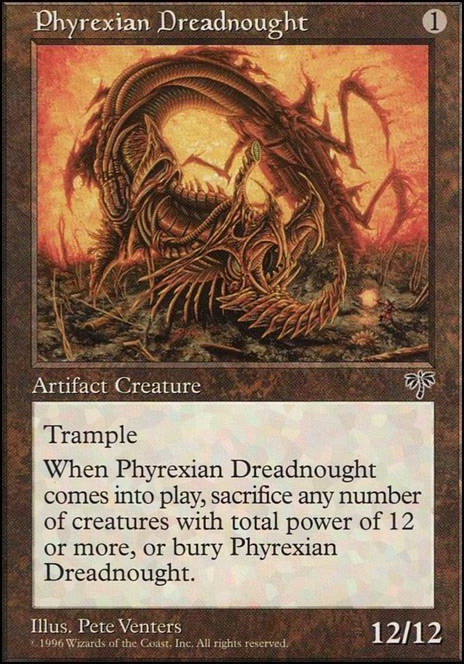 I found Phyrexian Dreadnought to be too pricy and found some similar includes. Hi and thanks for appreciating! It depends on what you mean by "competitive decks". If you refer specifically to the cEDH meta (decks like Food Chain Tazri, Jeleva Storm, Zur Doomsday, Thrasios & Tymna, Breakfast Hulk or Blood Pod) then the answer is no, my friends and I are not interested in this variation of the Commander format. If, however, you mean strong, optimised decks with powerful cards in them, then the answer is definitely yes. My personal metagame is all 75% decks: cards like Force of Will , Mana Crypt and Mana Drain are all over the place. I usually play against explosive/control decks such as The Locust God , grindy decks like Muldrotha, the Gravetide , aggressive ones like Edgar Markov and even fast combo decks like Food Chain Prossh, Skyraider of Kher and Teysa, Orzhov Scion . 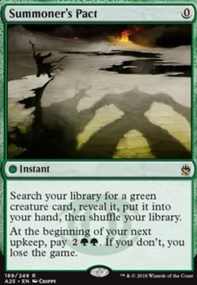 In addition to that, my friends have started including lots of "sideboard" cards in their maindecks to deal with decks such as mine. As a result, I also have to face multiple Rest in Peace s and Nihil Spellbomb s in every game. So, how does my deck perform in this scenario? Quite well. Of course I'm not winning every single game, because as I have said the other decks at the table are all very powerful. One thing I have noticed in these months of playtesting is that no matter how fast my opponents can be, I am always faster. If I want to kill an opponent before he or she can combo-off (therefore, by turn 4 or 5), nothing can stop me from doing so. The way I have built the deck, it is very easy for me to have one of our lethal combos ( Phyrexian Dreadnought + Vector Asp , Ornithopter + Crackdown Construct or even Wall of Blood ) available very early in the game with some cheap counterspell like Force of Will , Misdirection or Mental Misstep to save me from removal. Very few decks have the tools to deal with such nonsense. This is, however, not your ideal gameplan in a 4-player game. You would waste too many resources while at the same time leave yourself vulnerable to disruption from the two opponents left. Oftentimes, then, you just want to play the slow game until you have more mana and resources available in the late game. As a result, I generally don't even play Lazav until turn 5 or 6 (unless I have a Cavern Harpy in my graveyard to save him from removal). I tend to leave mana open in the early game for some counterspells, and then start committing more stuff to the board once I'm sure I can protect myself. In the meantime, hopefully my opponents have started damaging each other. Do keep in mind that this is a deck that shines in 1v1, sometimes 1v2. You have very few chances if three opponents gang up against you. 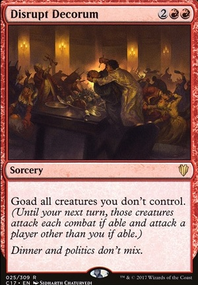 Having a 12/12 on the board on turn 2 will likely put a target on your head, so that's why you generally want to wait until one or even two opponents are already out of the game to expose yourself. This strategy has given me a lot of success so far, so that's the one I recommend to you. I think a great addition to this deck would be Varolz, the Scar-Striped because of cards like Phyrexian Dreadnought and Death's Shadow . They are all pretty great together. Hello everyone! I am looking for a Wheel of Fortune . Okay with any language, and honestly prefer heavy play / damage if it cuts the price some. I'd like to trade for it rather than buy, so here is a list of trade fodder I have(binder out of date). Not much but it's what I got!